Singles who can afford to spend on themselves have become a formidable consumer market. In 2013, Oxford Dictionaries announced that selfie, defined as “a photograph that one has taken of oneself, typically one taken with a smartphone or webcam and uploaded to a social media website,” was their Word of the Year. But there’s another definition. Economist Edward Yardeni uses “selfies” to describe singles who can spend on themselves or save for later because they’re not supporting a family, saving for college, or paying off a mortgage. William Frey of the Brookings Institute states in the City Families; Suburban Singles report, “More than 80 percent of nonfamily households are single persons living alone; of these, more than one-third are 65 years and older.” More than 125 million people are single in the US; more than half of all US adults are unmarried. From seniors to Millennials, selfies are found in every age, race, and income group. Reasons vary for being single. Young people burdened by student loans are postponing marriage and family to concentrate on their careers and pay off debt. Others are divorced singles, or seniors who may be newly single after the death of a spouse. For a large number of people who have never married, wedded bliss is not a goal. A survey by the Pew Research Center cites that a record number of Americans—in 2012, 20 percent of adults age 25 and older—have never married. These folks are quite content with the single life. 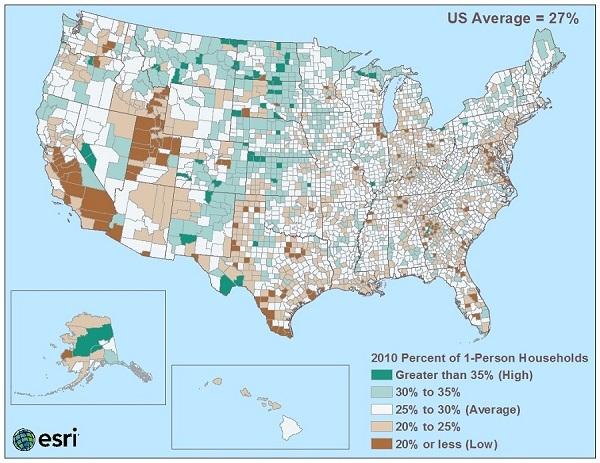 Younger selfies are found in densely populated urban areas, senior selfies are in many communities, and others are scattered across nearly every state. This map of the United States by County shows the locations of one-person households. Selfies are a formidable consumer market. The US Bureau of Labor Statistics estimates that they spend approximately $2 trillion on goods and services a year. Marketers are challenged to reach selfies because their demographics and interests are so scattered—one message definitely does not fit all. For example, food companies are attracting selfies with smaller portions, prepared meals, and other convenience foods. Because many Millennials snack during the day or eat out instead of sitting down to meals, companies have packaged “on the go” foods. More affluent selfies eat out frequently and grocery shop only for essentials. Because many selfies rent, major appliances and home improvement items don’t have much appeal to them; however, they will spring for fancy coffeemakers and floor cleaners. Electronics are always a major necessity for younger selfies who don’t mind spending for the latest upgrades. Adventurous selfies who want to travel can find a wide variety of options. Travel, resort, and hotel companies are targeting selfies with themed cruises, destinations, and travel packages designed for all ages. Where can you find information about single Americans or “selfies”? Available at multiple geographies in maps, reports, online, and in software, Esri Demographics contains variables such as age, income, race, ethnicity, and much more.